This feature is only available for our theme Focal (starting from version 5), our theme Kagami (starting from version 4), our theme Trademark (all versions), our theme Prestige (all versions) and our theme Warehouse (all versions). While our app SuperFields offer the easiest and fastest way, you can also use your existing metafield app by manually configuring it by re-using the correct metafields namespace/key: learn more by clicking here. All our themes come with an easy way to enable related products on product page. 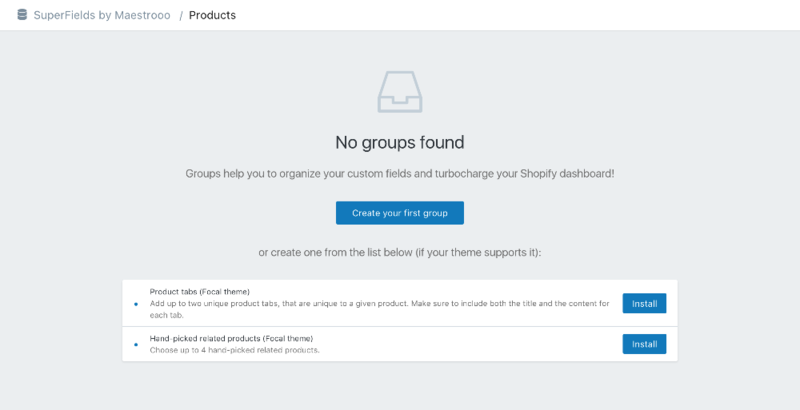 However, by default, the theme will randomly pick some products from your store and you will not have any control on which products are selected. Hopefully, all our themes natively integrate with our app SuperFields, which allows you to hand-pick related products on a per-product basis. You can follow our guide to learn more about how to use our app. Install our app. You can download it in the App Store by clicking here. This app is priced $8.90 / month (it has 7 days trial). Click on the "Install" button. It will automatically reload the page and display the configuration. Do not be afraid, it's already over, you can now leave the app! If you are not seeing this, or if the app says that "Your theme does not have any integration with SuperFields", make sure that our theme is set as the published theme. If it's not the published one, the application won't be able to detect it. If you have verified that the theme is indeed the published one, do not hesitate to contact us and we'll be happy to have a look! Now that the app is installed and properly configured, we can start some more interesting stuff. Please note that you may need to wait up to 30 seconds after saving before the changes appear on your product pages.